Does olivia voldaren's first ability trigger deathtouch and lifelink? why doesn't Deathtouch and Lure kill all blocking creatures? Keranos god of storms with death touch? After looking at you combat trick section, I would vote for replacing Krosan Vorine with Lowland Tracker . It does cost 1 more mana, but it has first strike. You pair that with Bow of Nylea , Basilisk Collar , or Gorgon Flail (other strong inclusions in a deck with Mirri) and now the Tracker is just straight removal. Also, some other fun cards with Lure effects are Druid's Call , Saber Ants , and Broodhatch Nantuko . 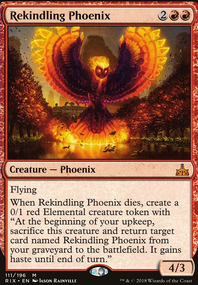 Shamanic Revelation can be pretty potent card draw in a token deck as well. Yes you need a board state to get anything, but it has pretty high upside. 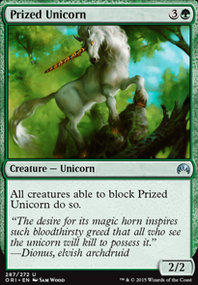 Since this deck is so colored mana hungry and your curve is on the high end, I would suggest more ramp that provides you with colored mana. Commander's Sphere , Fellwar Stone , Solemn Simulacrum , Mox Amber (you play a lot of legends), and Izzet Locket are excellent places to start. Lobber Crew could be another fun pinger and since you are already running a number of creatures who can ping, a card like Basilisk Collar or Gorgon's Head might kick things up a notch (especially on Tibor and Lumia ). If you want to continue with the big beefy, mulit-colored dragon route, Hypersonic Dragon might be a good inclusion. I also noticed that you are 1 card over 100. 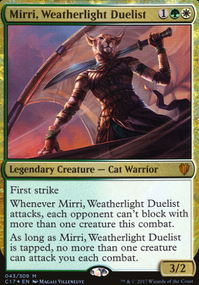 I'd suggest cutting Saheeli Rai as she doesn't have much synergy with the rest of your deck. Hi! I love the build you got here, there's a lot of differences between yours and my Voltron version you commented on! Like you mentioned in your comments, wheels pair nice with Smothering Tithe , but playing a card you don't like doesn't feel great either. If you go the route of more tokens; Skullclamp is a great add for token decks, 1 Mana to draw 2 is hard to beat. Dawn of Hope may be a good card as the Mana sink is nice, but is very dependent on life gain. If you go spellslinger; Aetherflux Reservoir is a great wincon, which you already have in your side board. 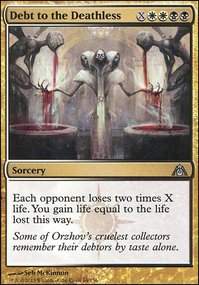 Increasing Vengeance , Reverberate and the spell copiers like it are all great adds, double your own spells, copy someone else's spell (my favorite target is a Kodama's Reach ) or copying another players counterspell. I think the only 2 questionable inclusions out of the list that I see are Magnetic Theft and Basilisk Collar . Magnetic theft works great to steal others equipment, but having reliable targets of your own (like sunforger, which you're against) to equip for cheap make it more valuable. 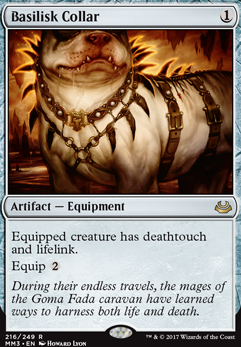 Also, basilisk collar doesn't seem to fit the deck too, besides just being a nice equipment for Feather. If life gain is a theme, then it's a great fit! Be sure to be careful with Lightning Greaves too, shroud on my creature that I want to target has ruined my day before. Other than that, you have a great list here! Once you have more of a focus, just a few small tweaks and you should have a solid deck! channelfireball12345 Ya my idea for the Hex was to trade down that the counters at a 1/1+1 instead of the normal 3/1 cost. But AEther Snap is fantastic so it will take the place of Hex Parasite , and I replaced Basilisk Collar with Swiftfoot Boots . Big thank you for the suggests! I love this deck. Consider Memorial to Folly as a late game way to get someone back in action. Kaya's Wrath if you need a sweeper for the crazy aggressive decks. No Vampire Nighthawk ? I found that it deters people from attacking me at all when they can pick a target with no death touch. On that note, you get the same effect from Basilisk Collar which is transferable to any weenie you have. Gifted Aetherborn gets you there too. Vault of the Archangel when you are just done with people attacking you. Beacon of Immortality if being decked is ever a thing for you, and to watch your opponent's faces. Overall I love this deck and it is definitely giving me tweeks for my own Karl deck. Thank you. I'll keep watching. Consider adding "Budget" to the deck's hubs. Needs at least 5 more lands, probably 7-9. Thoughtcast is probably better than Thirst for Knowledge . Fabricate is also another good option here. 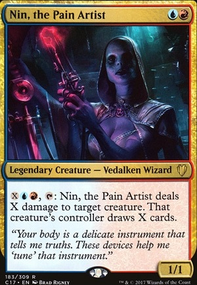 Etherium Sculptor seems like it would be helpful. Maybe some equipment might be useful, too - like Basilisk Collar perhaps.